I have put a list up of my favourite ten red lipsticks available in Canada. From deep dramatic shades, to bright classic ones, here are the best options for you to try out! Stila - Stay All Day Liquid Lipstick in "Beso"
Ever since Alexandria Ocasio-Cortez wore this lipstick during her Democratic Primary win for N.Y’s 14th Congressional District, the colour has been sold out at Sephora’s North America Wide. This lipstick hue is bright but wearable, the ultimate statement lip. Smashbox - Always On Matte Liquid Lipstick in "Bawse"
MAC Cosmetics - Lipstick Matte in "Ruby Woo"
A makeup staple in not only my bag, but queen Rihanna’s too (pre Fenty of course), Ruby Woo is an outstanding colour that looks amazing on every skin tone. Also, the undertone of blue in this lipstick shade actually makes your teeth look whiter. Too Faced - Peach Kiss Moisture Matte Long Wear Lipstick in "Breakfast Club"
The strawberry-red hue is the vibrant red shade of your dreams. The formula is infused with peach and sweet fig milk making it extremely hydrating, especially for a matte lipstick. Pat McGrath - MatteTrance Lipstick in "Elson 013"
Matte Trance has one of the most beautiful formulations on the market. The opacity and pigment achieved in one swipe is unparalleled to whats available in most makeup stores. This lipstick is no exception, the red shade is perfect on every skin colour because of the blue undertone. NARS - Velvet Matte Lipstick Pencil in "Dragon Girl"
This colour is Taylor Swift’s favourite. The long lasting, non-drying formula is enriched with Vitamin E with a combination of unique silicones, ensuring long-lasting, seamless matte colour for hours. Bite Beauty - Amuse Bouche Liquified Lipstick in "Flambe"
As someone who doesn't like glossy lipsticks, I was surprised at how beautiful this one was on. The cherry red colour is gorgeous, and silicone free. The formulation also contains monoi butter and coconut oil to keep your lips quenched. This budge-proof shade is the classic red that will not only leave your lips looking like Marilyn's, but its formula keeps your lips hydrated, so they don't become dry and flaky. This brick-red lipstick is the perfect transition shade from summer to fall. 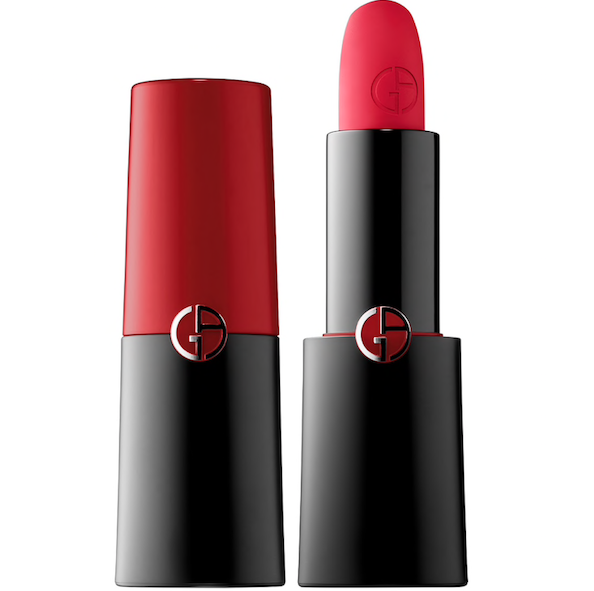 The colour payoff is intense, but leaves your lips soft. This creamy formula dries quickly at doesn’t bleed into the fine lines around your mouth. The colour is a regal red, fit for the queen of hearts.